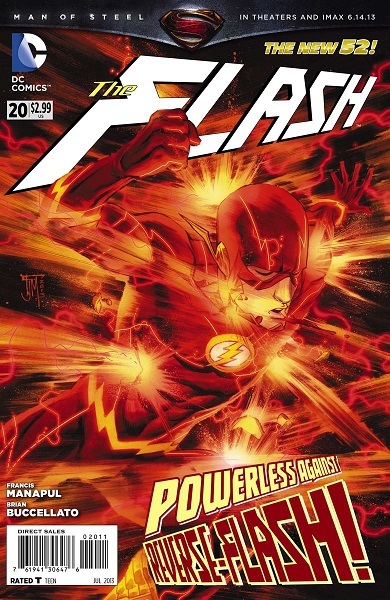 Francis Manapul: For better or worse, Reverse-Flash has been an important part of The Flash’s life. He also played a huge part in “Flashpoint,” which lead us to where we are today. We want to respect history, but we don’t want to be beholden to it. So we thought it would be best to start from the beginning and introduce a new version, with new motivations. It just felt right to give him a new power set, based on the events of his origin. Brian Buccellato: Yeah, like most everything we do, his origin and power set came from lots of conversations about where to take Barry/Flash. There have been some really epic Reverse-Flash stories and we didn’t want to rehash them; so we elected to go in a different direction…I’m most interested by the psychology behind Reverse-Flash’s actions. He is willing to commit murder to achieve his goals. So there is some kind of psychotic break from society that enables him to operate without remorse. But, like most people with twisted morality, he doesn’t see himself as a villain. Exploring the reasons why is ultimately what intrigues me about him. FM: Reverse-Flash will have a new power set that will counter Flash’s forward motion. This won’t just pose a physical threat, but also an emotional one. Barry has made strides to get over his past, and the events of this storyline could send him reeling back. BB: Iris isn’t out to “steal” Patty’s boyfriend or anything, but it’s fairly obvious that she feels a connection to Barry. The question we are going to explore is whether that connection is an emotional one, or a product of the Speed Force. FM: There’s gonna be a lot of running. Questions about Kid Flash’s past will begin to surface. BB: Yeah, lots of running. For more, including notes on the Reverse-Flash’s costume design and some great, bromantic quotes about working together, check out the full piece at MTV Geek! Thanks for the link. I can’t get my head around a red Reverse-Flash – reverse those colours already! And I’m sad to hear the guys are still taking Barry’s rewritten tragic past into consideration, it takes Barry too the level of so many other heroes in terms of motivation … what’s wrong with a hero who’s basically in the hero game because it’s the right thing to do, a guy whose disposition is sunny rather than super-serious?